Download Admit Card for West Bengal Food Sub-Inspector Examination 2014. Get all the types of helps about WBSSC Food Sub-Inspector and Supplies Exam, syllabus, question papers pattern, selection procedure. New date of examination. And other useful update information about WB Food sub inspector examination. West Bengal Staff Selection Commission organised a new examination for West Bengal Food and Supplies department. West Bengal Food sub-inspector and Supplies service (Grade-III), total vacancy for this post is 1,131. Online application process over already. Candidates can download their admit card for WB Food sub inspector examination 2014 online. The examination date changed from June to July. The new examination date for WB food sub-inspector examination is 27th July, 2014. For more details keep reading. 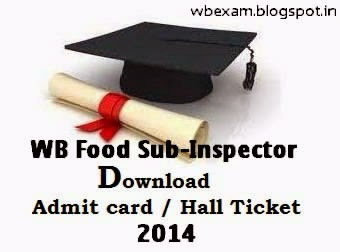 Download WBSSC Food Sub Inspector Exam 2014 Answer Keys. The candidates who have passed the Madhyamik examination and age between 18 years to 40 years can apply for this post. Total number of vacancy for is this is 1,131. Salary: Pay Band- 2(Rs. 5,400-25,200) initial pay in the Pay Band Rs. 6,240. Garde Pay Rs. 2,600. This examination is conducted by West Bengal Staff Selection Commission. The examination date is 27th July, 2014. West Bengal Staff Selection Commission select the candidates for WB sub inspector post through Written Examination and Personality Test. The written test will be have maximum 100 marks with 15 questions. Written Test will be contains two sections one is General Studies which contains 100 questions and each question carries 1/2 marks (total 50 marks) and Arithmetic with 50 questions, each carries 1 marks (total 50 marks) Questions will be objective type and negative marking for every wrong answe is applicable. For every wrong answer on General studies section 0.125 marks and on Arithmetic section 0.25 marks will be deducted from the total marks. Total duration of test is 90 minutes. Candidates will be short listed for Personality Test on the basis of their written test. The personality test will be 20 marks. Candidates must have to read, write and speak in Bengali or Nepali and should have to mentally ans physically fit. After passing the Personality Test, candidates are able to join as a food sub-inspector on West Bengal. Question papers for written examination will be set from the Madhyamik syllabus of WBBSE with mental ability. Date of examination for WB food sub-inspector changed and new date for this exam is 27th July, 2014. (Time of exam 🙂 12:00 pm to 1:30 pm The result of written test will be published on August. The personality test will be done on August to September. The Final merit list will be announced on October. Candidates can download their admit card online from the first week of July. Admit card for WB Food Sub-Inspector will be sent also through speed post. Candidates can download their admit card from the official website of WBSSC, www.wbssc.gov.in. • Download Admit Card for West Bengal Primary TET 2014. For more update details and information visit this site. This is a short from the notice, for view the original notice please visit, wbssc.gov.in. Best of luck for every candidates from wbexam site.